” I am writing to you on behalf of my son Fabian. Fabian was diagnosed last year with a brain tumour and has had a very difficult journey since which continues to this day, even though times are tough for him and his life is not what we expected or wanted we remain positive as does Fabian that every day we he will be a little bit better and we can give him as much joy and happiness as is possible. On the 1st of September he celebrated his 3rd Birthday, this was a very special day for Fabian, ourselves and all who visited us to help celebrate. 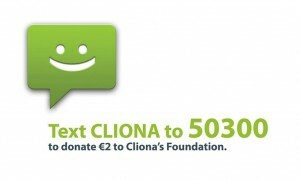 We asked our guests to make a donation to the Cliona’s Foundation through a savings box that was in the house on the weekend in lieu of presents for Fabian, this we thought as at the moment he had not much interest in playing with toys apart from those already familiar to him would go some way to paying back the Cliona’s Foundation for their help in recent times.